Yesterday, I was contacted by the PR firm for a large orange juice manufacturing company asking me to help promote something or other in exchange for a giveaway worth a $200 gift card for a high end outdoor apparel company. The hook was that the actor promoting their product was interested in green living. As tempted as I was (on your behalf, of course), I failed to see the connection between the actor's personal interests and the company being green so I asked, since I had yet to see anything sustainable or organic about their products. I was forwarded some information on the company and how it was going green. Basically, the primary message was that the company is "dedicated to using the Earth's natural resources in a responsible manner and has made sustainability part of its mission. The company works toward environmental sustainability by reducing, reusing and recycling whenever possible, and overall pursuing initiatives that help preserve the environment for generations to come." It then went on to say how they have partnered with Cool Earth to help protect the rainforest and that they even went so far as to have the carbon footprint of each half gallon of OJ calculated. All laudable actions, but where's the juice? Well, their cartons are made largely of a renewable resource (85% paper and 15% polymer). Umm. Okay. How about using recycled materials? That would certainly be considered a bigger commitment. Saying they are using a renewable resource like virgin paper products is certainly better than, say, using plutonium, but is that really something they should be tooting their horn about? Most of the other things mentioned certainly have a positive environmental impact as a result (like recycling and reducing water usage) but, underlying it all I would gather is the cost savings resulting from reducing operations, packaging and energy costs. Finally they state, "a driving force behind this mission is Pepsico's Performance with Purpose approach: injecting a commitment to social and environmental performance into all of its businesses." The thing that would have the biggest impact in showing their commitment to the environment would be to source their oranges from producers using organic or sustainable growing practices, instead of their "save the rainforest" legerdemain. The reduction in pesticides alone would have a more positive impact than buying a few acres of rainforest. But, that would make their product more expensive and they would lose market share. You see, a half gallon of Organic Valley Orange Juice (in my area) is $5.99. It'll cost ya $6.99 if you like pulp. Compare this to the mainstream stuff made from what I like to call, "downed oranges", which sells for $3.99. There's just not that big a market for high end OJ, methinks. And, it certainly looks better to pretend like you are a green company even if your products aren't so green. Or orange, for that matter. Commitment to the environment? Maybe. Most likely it's a whole lot of business acumen coupled with a lot of greenwashing. Perhaps the greenest thing of all would be to juice your own locally grown oranges and if you don't live in a citrus producing state....don't drink OJ. Or eat Bananas or Mangos. Similiar to a macro way or just a localvore mindset... it's greener to eat local and seasonal (AND HEALTHIER) than partake in the global expansion of our foods. I'm just being the devil's advocate here. I am just as guilty because i just drank a welch's orange fushion after waking up from a nap with a head cold. I should have just juiced the beets and fennel in my fridge but my mind thinks OJ when I have the sniffles. ANd I love pluots...but they don't grow here. Figs...hell yeah. So, we ALL should really consider our own part in the equation. Are they green-washing? Only as much as we buy into it or need to see or hear about green initiatives before we buy it. As if this helps remove some green guilt. 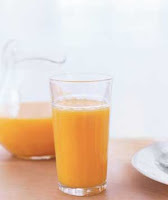 If we REALLY were concerned about the green aspect of orange juice we wouldn't buy a commercial oj. Even the organic brands.... while greener than others... the act of producing a commercially viable oj is not green. Scroll down to May 21st. Thanks for posting that link Malva. The contents didn't surprise me-just reconfirmed what I think about the "industrial food" industry. Living in northern Vermont, we have limited access to fresh citrus fruits-but we do okay without them. I was in California earlier this year on business. Watching tractor trailer after tractor trailer of lemons being driven on the interstate in uncovered trucks -really got me thinking about how our foods get from the tree to the table. Unless it's local-very little is fresh when it arrives in Vermont! I'm not a fan of OJ. Like bananas, oranges seem like such foreign fruit to me, and have my whole life. Anyway, I'd like to see the numbers. That's what it all comes down to with greenwashing. If your company is "going green," then give me some actual factual data about it, so I can judge for myself, instead of just making broad statements and expecting me to believe them. We gave up OJ because it isn't local, but we will splurge in the winter and buy a crate of oranges! Well, it does indeed sound like greenwashing. Whenever a company tosses out vague crap about recycling etc and givs no hard figures and then doesn't use recycled materials for packaging, office paper etc, it seems bogus. Personally, I rarely drink oj only because it is way too much sugar for me. All juice is mainly sugar and water with far fewer nutrients than the fresh fruit. I find the more words that a company uses to describe their green(washing) practices the less likely they are actually doing anything useful and sustainable. It's hard to hide anything when you use simple, straight forward sentances. Because of the diabetes- I don't get to drink OJ- once in awhile as a treat- I do get to drink Crystal Light Fake (tang-like) OJ, now there is a product that could use a good greenwashing! I read an interesting sci-fi short story in which all advertising had to be strictly factual, no superlatives or emotional claims. I wish we could save the drama for fiction. I'm allergic to oranges (and most citrus) but agree about oj. I get local apple if I really need something or make my own fruit drinks. The kids sometimes get some as a treat but I do try to make it local. Last I heard, some recycled materials (certainly plastics, maybe paper too) weren't approved for food grade packaging when it comes into direct contact with the food item, due to them not knowing the source. (Would you really want to drink out of a carton that was recycled from a laundry detergent box?) Glass is fine, of course. Pepsico means Tropicana. Oops! Discovered the evil brand.